The United Club in London Heathrow is my favorite United Club in the network and a great place to work or eat prior to your flight. This lounge does get crowded in the morning, just like the nearby Air Canada lounge. While I had no trouble finding a seat, it was certainly running on the full side. I like the retro United photographs framed around the lounge. I was in the lounge during the breakfast window and very much enjoyed a hot breakfast of eggs, bacon, and sausage with porridge and cappuccino. The buffet is superb and since most lounge guests are waiting to board a longhaul flight, there is not the vulture/hoarding mentality on display we see at so many domestic U.S. clubs. A full bar offers many alcoholic drinks, all complimentary. Smoothies are also available and I enjoyed a strawberry one. What I appreciated most about the lounge was the superb staff. Every staff interaction was positive: they were cheerful, jovial almost, friendly, and extremely polite. Showers are available (I did not have time for one) and I am not including any restroom pictures because there were so many in the restroom. This LHR Terminal 2 lounge is located opposite Gate B46. It is open daily from 5:00a.m. to 10:00p.m. seven days a week. 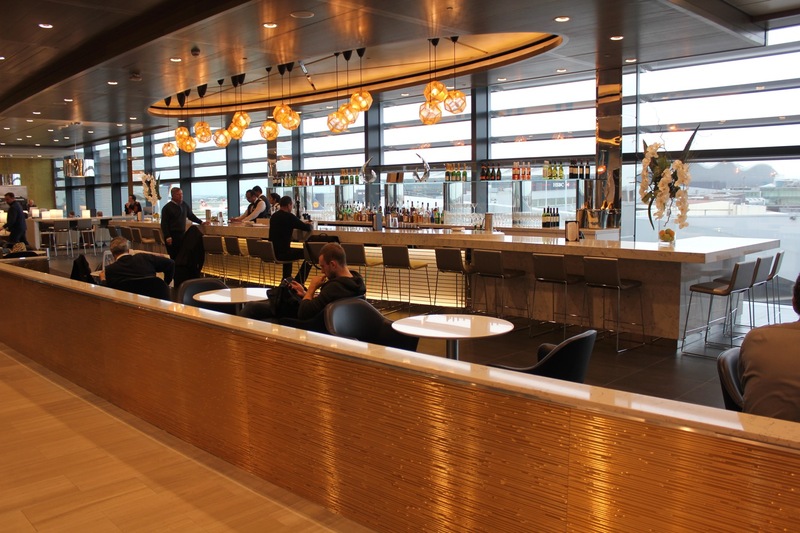 In terms of design and amenities, this ranks as one of the top lounges in the system. What truly won me over was the excellent English breakfast and the charming staff. That’s a (surprisingly) impressive beverage list! Great review, as always. Yes, a beautiful lounge with great food and beverage, it is hard to believe you are in a United lounge compared to the domestic UA lounges. Not having been to a Polaris lounge yet, I do not know how it compares to those. The showers are very modern and clean, too. It is in the T2 B gates, which is a 20 minute walk from the A gates where a lot of Star Alliance partners fly from) but still worth if if you have the time. I would say it is better than the LH, BA business class and PP lounges, as well as the Skyteam in T4 (though those are also quite nice). I like the BA Concorde Room in T5 a little better, though it is getting a bit threadbare. By the way, you have a picture of the Global First lounge on the side, which is mainly a small bar and seated restaurant which is also very good. I wonder what will happen to it as they phase out GF later this year. It is also my favorite. The English breakfast buffet is outstanding. My only complaint is that they don’t have enough toilets. Other than that it is the best Club they have. Totally agree with your review! Lunch buffet also very good, particularly the shepherds pie!! Agreed. The single best United Club I’ve been to anywhere, and, IMO, the best Star Alliance lounge at LHR. Those leafless “trees” look rather appropriate for the ongoing heatwave. My favorite United Club also–go through there many times a year, I will even skip breakfast at the hotel and have it in the club–that’s saying something. While waiting last year in between flights my Biz ticket allowed access to Lufthansa’s club and then the Senator’s club within the club. Complete with a nice sleeping / quiet room, great food, and excellent service! Had A shower in the United club and was also impressed. I’ll post a Lufthansa LHR Lounge Review next. It’s a very decent lounge indeed.